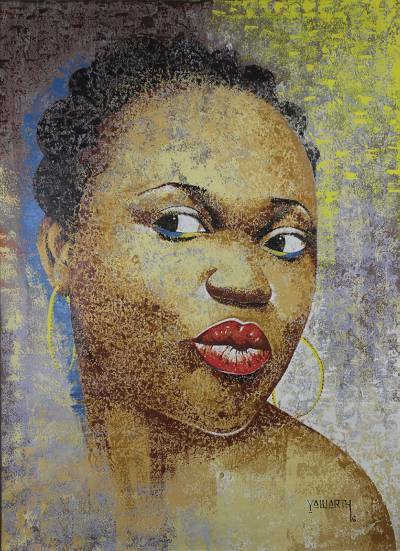 Original Portrait of a Women Acrylic Painting from Ghana, "Ahoufe"
The versatile and talented artist Daniel Nana Yaw Arthur-Baidoo of Ghana paints a luminously beautiful portrait of a woman in this original acrylic on canvas. He names the impressionistic painting Ahoufe, which means "beauty" in the Akan language. The subject's sidelong glance, pouting lips and slightly coy pose are bewitching. "I often recycle plastic waste for artistic and functional … In this light, I believe in my own small way, I am contributing to… alleviating the plastic waste menace in my community." "Daniel Nana Yaw Arthur-Baidoo is my name. I was born on June 25, 1987 in Accra and I practice painting and stone carving. My friends describe me as a go-getter, an ambitious and very appreciative person. "Most certainly I have experienced difficult moments in my life which I am proud to say I have overcome. One typical difficult moment was after my national service and I decided to take art as a full time job. I vividly remember that back then I didn't even have two cedis to buy airtime but I knew in my heart that I had what it takes to break through. All I needed was a smart phone to be able to tap into the power of social media and market myself to the outside world. I am proud to say that I overcame that obstacle and can say that I have held exhibitions even in New York. "One embarrassing moment was when I tried to do a 360 dunk in a basketball game at my hostel just because the ladies were watching from their balconies. Unfortunately for me, I mixed up and landed on my bottom. I could hear all the girls laughing out loud. I stayed on the floor for minutes because I was too embarrassed to get up. It was embarrassing but really funny at the same time. "I cannot state exactly what drew my interest to art but I can say art has always been my passion since childhood. As I grew older, the passion only grew stronger. I was not taught. It is a God-given talent. "I had only to better myself by advance training at the university where I obtained a bachelor’s degree in fine art. I learned practically and theoretically on how to master painting and sculpture. "I sometimes recycle wood waste, or sawdust, in some of my paintings. It's easy to manipulate and use. However, it is a tedious process. In addition to sawdust, I used acrylic paint, which is easy to work with. "My favorite part of my art is the uniqueness of the roller effect. The roller provides an intricate design by accident, which is practically impossible to recreate. The most challenging part is defining the ends of my designs on the canvas with the roller since I barely use the brush to paint. "I draw my inspiration from the rich cultural heritage, the diverse ethnicities and mannerisms of tribal peoples in Ghana and Africa at large. I draw my inspiration from the in-depth history of the continent of Africa. I often recycle plastic waste for artistic and functional products such as paintings, sculptures, furniture etc. In this light, I believe in my own small way, I am contributing to sanitation and alleviating the plastic waste menace in my community. "Starting on my own has not been an easy walk in the park. The struggle is real. Sometimes you are up and others you are down. Working on my own was a strong decision I had to take and stick with, regardless of the obstacles before me. "With my love for kids, I'd like to work with NGOs on projects pertaining to poverty reduction, hunger projects, children's educational programs and child labor alleviation. I would like to do this through my art because I believe art must help solve societal issues."